Treatment for killing floating submerged and planktonic algae in ponds and lakes. Algaecide and herbicide that treats up to 1 acre. 100% safe for water use immediately. Made in the usa. .
Landscape and aquatic herbicide ultra concentrate that treats up to 10000 square feet. Effective herbicide treatment for emergent weeds along shoreline. Safe for fish swimming waterfowl and livestock. Made in the usa. .
Non-ionic water soluble product that speeds weed kill treatments. Improves the absorption of post emergence herbicides. 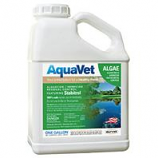 May be used with aquavet shoreline weeds herbicide (bci# 023541) and aquavet submerge weeds herbicide (bci# 023542). Made in the usa. .